I lost a good friend last Sunday, that I had never met. Gordon B. Hinkley, president & prophet of the Church of Jesus Christ of Latter-day Saints passed away last Sunday. Although I never met GBH in person I have heard him speak countless times and read so many of his writings, speeches, sermons, & tales. 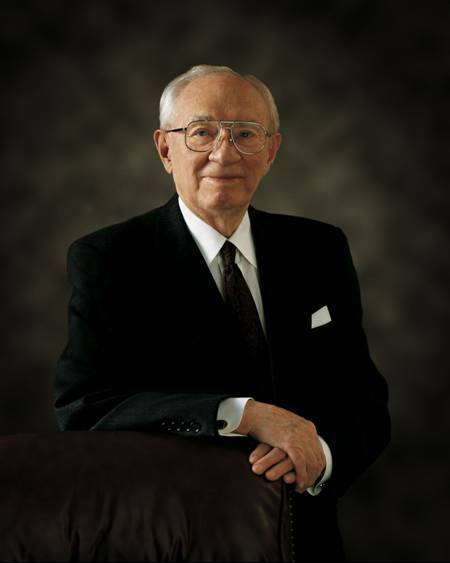 He served as an Apostle from 1961 until he was called as president in 1995. He has been a constant presence in my life. Under his watchful care church membership grew by leaps and bounds and the the number of temples grew from 56 to over 120. He died at the age of 97 with a full calendar. He never stopped for anything. He was hard working and caring. In his best-selling book “Standing for Something” he championed the virtues of love, honesty, morality, civility, learning, forgiveness, mercy, thrift and industry, gratitude, optimism and faith. He also testified of what he called the “guardians of virtue,” namely traditional marriage and family. President Hinckley you will be missed. God be with you ’til we meet again. This entry was written by J.Peter and posted on February 3, 2008 at 8:55 pm and filed under Weekend Offtopic. Bookmark the permalink. Follow any comments here with the RSS feed for this post. Post a comment or leave a trackback: Trackback URL.